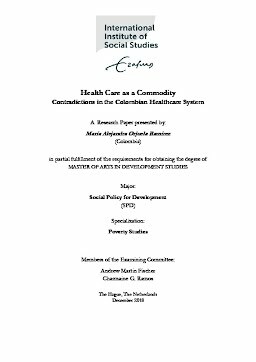 The present study aims to address the following central question: why the Colombian Healthcare System has not accomplished its initial purposes of full coverage and equal service provision although institutional reforms have made it more integrated in terms of access, entitlements and funding management? Institutional approach is used as a method to deter-mine if the healthcare system has attained its purposes of expanding coverage and equal quality services. Three main features have made the system more unified: equal and generous entitlements, measures regarding access and, finally, the centralized administration of the health care sources for one fund and conclusion. However, this system of commercial pro-visioning and commoditized pricing reinforces the idea of health care as a commodity. This may undermine government objectives in a context of cyclical fiscal constraints because the managed competence model can create incentives for commoditization of prices and yield high costs, thus jeopardizing the financial sustainability of the system.